Keep track of the people and places you care about most in brilliant HD. Whether you're using a smartphone, tablet, or computer, a click or two is all you'll ever need to check in.Stay connected by receiving alerts when motion detected and talk directly to your love ones. Full 720p HD image quality-you can see crystal clear and detailed images with this high resolution camera. Easy and Quick Setup. Turn on the camera and complete the network configuration in just minutes. Connectivity:IP/Network-2.4GHz Wireless(Incompatible with 5GHz). 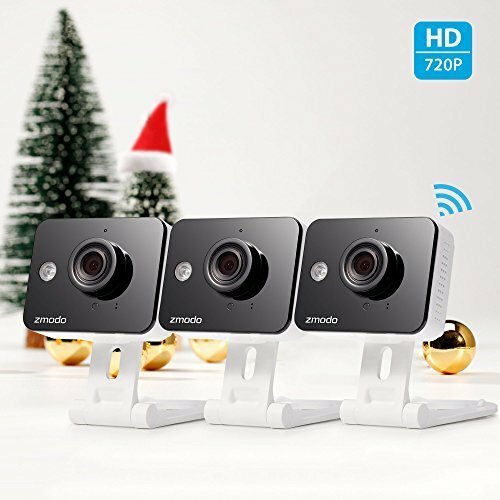 Always Stay Connected -Seamlessly stream video and two way audio directly via the mobile Zmodo app for iOS and Android or via Internet browser on user.zmodo.com.Receive intelligent motion alerts when motion detected. With a 115° field of view, you can use one camera to capture an entire room without ever having to pan or tilt.IR Night Vision-See what's happening in the dark with automatic infrared lights. 3-Year Limited Warranty-US Warranty and Lifetime Support.No monthly fees or service contract required.